The 2017 IAAF World Championships was the 16th edition of the global athletics competition organised by the International Association of Athletics Federations and was held in London from 4 to 13 August 2017. London was officially awarded the championships on 11 November 2011. When the seeking deadline passed on 1 September 2011, two candidate cities (London and Doha) had confirmed their candidatures. Barcelona, which investigated a bid, withdrew citing a lack of support from the local population and financial difficulties. On 5 September 2011, Doha launched its marketing bid for the 2017 World Championships. The slogan of the bid was "The RIGHT PARTNER for a stronger World Championships." The bid was led by Abdullah Al Zaini and Aphrodite Moschoudi. Moschoudi successfully led Qatar's bid for the 2015 Handball World Championships. Doha also brought in Brian Roe, a member of the IAAF Technical Committee. The bid was for the championships to be held in the renovated, climate-controlled Khalifa Stadium. The Corniche promenade was to hold the road races, with the committee proposing to hold the marathon at night after the opening ceremony. On 6 September 2011, London unveiled its bid for the 2017 championships with the slogan "Ready to break records." This was London's fourth bid in less than 15 years to host the event. The London bid team said that if their bid was successful they would introduce the "Women in World Athletics" programme. The IAAF Evaluation Commission visited London on 2–4 October and Doha on 4–6 October. On 11 November 2011, the winner was officially announced as London. 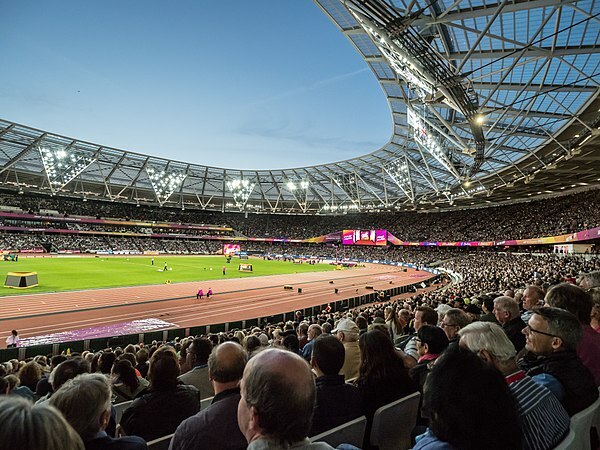 The championships were held in the London Stadium in Stratford, London, which hosted the 2012 Summer Olympics, and has a capacity of 60,000. Rights to televise the championships in the United Kingdom were held by the BBC. NBCUniversal was the rights holder in the United States. In Canada, rights to televise the championships belonged to the Canadian Broadcasting Corporation. The mascots for the IAAF Championships and World ParaAthletics Championships were unveiled in April 2017, and chosen through a children's design contest organised by the BBC programme Blue Peter. The mascots represent "everyday" endangered species of the UK; the IAAF Championships mascot is an anthropomorphic hedgehog named Hero the Hedgehog, and for the ParaAthletics, Whizbee the Bee. The qualification period for the 10,000 metres, marathon, race walks, relays, and combined events runs from 1 January 2016 to 23 July 2017. For all other events, the qualification period runs from 1 October 2016 to 23 July 2017. The Women's 50 kilometres walk was held for the first time. ^ IAAF does not include the six medals (1 gold and 5 silver) won by athletes competing as Authorised Neutral Athletes in their official medal table. An outbreak of norovirus occurred at a local hotel affecting 30 athletes and officials. An anti-doping programme was overseen at the championships for the first time by the Athletics Integrity Unit (AIU) – an independent anti-doping board within the IAAF. A total of 1513 samples were collected at the competition and were sent to Ghent for analysis by a World Anti-Doping Agency-accredited laboratory . The samples comprised 596 urine sample (212 of which were tested for erythropoietin) and 917 blood samples. The blood samples were divided into two forms – 725 were taken to feed into the long-term athlete biological passport initiative and 192 were taken specifically to identify use of human growth hormone and erythropoiesis stimulating agents. The in-competition anti-doping scheme was complemented by a more extensive out-of-competition testing programme, which was intelligence and performance-led and amounted to over 2000 blood tests and over 3000 urine samples. An anti-doping education initiative also took place, led by the AIU and the IAAF Athletes' Commission, including an Athletes' Integrity Pledge which was taken by around 2500 athletes. Two of Ukraine's foremost athletes, Olesya Povkh and Olha Zemlyak, were suspended for failed doping tests immediately before the championships in London. The initial findings of the in-competition tests were that three athletes tested positive for doping, none of whom were medalists. The names of the athletes were not announced, allowing the athletes to contest the result and request a b-sample test. ^ On 31 July 2017, IAAF announced that Russia was still banned indefinitely unless several criteria for reinstatement were met, including meaningful drugs testing being conducted and more acceptance of the McLaren report which exposed the country's state-sponsored doping and led to the ban. ^ "London selected to host 2017 IAAF World Championships". IAAF. 25 August 2007. Retrieved 30 August 2015. ^ "IAAF Council Meeting and IAAF / LOC Press Conference summary – Daegu 2011... UPDATED". IAAF. 4 September 2011. Retrieved 11 August 2017. ^ "Exclusive: Two bidders for 2017 World Athletics Championships after Barcelona withdrawal". Inside the games. 2 September 2010. ^ "Qatar submits bid for 2017 world athletics event". Arabian Business. 2 September 2011. Retrieved 11 August 2017. ^ "Exclusive: Doha 2017 promise to "overcome technical and mental barriers" to stage World Championships | Athletics". insidethegames.biz. 5 September 2011. Retrieved 11 November 2011. ^ "Doha 2017 Candidate City for 2017 IAAF World Championships | Venues". Doha 2017. Archived from the original on 8 November 2011. Retrieved 11 November 2011. ^ "UK bids for 2017 World Athletics". BBC News. 11 March 2011. ^ "London 2017 unveil World Championship logo and slogan | Athletics". Inside the games. 6 September 2011. Retrieved 11 November 2011. ^ "London 2017 announces Women in World Athletics programme". European Athletic Association. Archived from the original on 14 November 2011. Retrieved 13 November 2011. ^ "2017 IAAF World Championships Evaluation". IAAF. 20 September 2011. Retrieved 11 August 2017. ^ "London 2017 will smash records for ticket sales to become biggest World Championships in history". The Daily Telegraph. 29 July 2017. Retrieved 1 August 2017. ^ "BBC wins broadcast rights to 2015 and 2017 World Championships". BBC Sport. 24 November 2011. Retrieved 14 September 2016. ^ "NBCUniversal acquires Universal Sports programming from World Championship Sports Network". NBC Sports Group. 16 November 2015. Retrieved 14 September 2016. ^ "Olympic Sports Schedule". NBC Sports Group. Retrieved 18 April 2017. ^ Bassett, Simon (25 July 2017). "CBC Sports has Exclusive Canadian Coverage of the Iaaf World Track and Field Championships, August 4–13". Canadian Broadcasting Corporation (Press release). Toronto, Ontario, Canada. Retrieved 26 July 2017. ^ "'Hero' and 'Whizbee' are named as World Championships 2017 mascots". BBC Sport. 19 April 2017. Retrieved 13 July 2017. ^ "Placing table – IAAF World Championships London 2017". iaaf.org. Retrieved 16 August 2017. ^ "IAAF submits guidelines to Russian Athletics Federation for applications to compete as neutral athletes in international competition in 2017". IAAF. ^ "IAAF approves the application of a further eight Russians to compete internationally as neutral athletes". IAAF. Retrieved 23 July 2017. ^ "Russia's ban will continue, says IAAF". IAAF. Retrieved 31 July 2017. ^ Churchill, David (10 August 2017). 'No home, no flag and no national anthem' – the first refugee squad at the World Athletics Championships. Evening Standard. Retrieved 2018-03-05. ^ Ndege, Yvonne (3 August 2017). Refugee team competes in World Athletics Championships. UNHCR. Retrieved 2018-03-05. ^ Athlete Refugee Team 2017 World Championships. IAAF. Retrieved 5 March 2018. ^ "London 2017: 30 people fall ill after norovirus hits athletics event". The Guardian. 8 August 2017. Retrieved 11 August 2017. ^ MacKay, Duncan (27 August 2017). Three positive drugs tests at IAAF World Championships. Inside The Games. Retrieved 2018-03-14. ^ Independent Athletics Integrity Unit is operational . IAAF (5 April 2017). Retrieved 2018-03-14. ^ Athletics Integrity Unit Announces Summary of IAAF World Championships London 2017 Program. Around The Rings (25 August 2017). Retrieved 2018-03-14. ^ Slater, Matt (4 August 2017). World Athletics Championships 2017: Two Ukrainian athletes suspended for positive drug tests on eve of tournament. The Independent. Retrieved 2018-03-14. ^ World Championships 2017: Three 'adverse' London findings investigated. BBC Sport (27 August 2017). Retrieved 2018-03-14. Wikimedia Commons has media related to 2017 World Championships in Athletics.